Brædstrup is a former railway town in Jutland, Denmark at the railway between Horsens and Silkeborg which was closed in 1968. 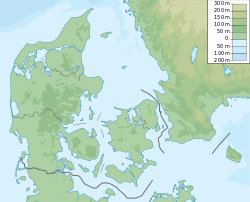 Until 1 January 2007 it was the municipal seat of the former Brædstrup Municipality and today, with a population of 3,653 (1 January 2018), it is the second largest town of Horsens Municipality, Central Denmark Region in Denmark. Kristian Thulesen Dahl (born 1969 in Brædstrup) a Danish politician, leader of the Danish People's Party since 2012, member of the Folketing since 1994. Brædstrup Church; Built in 1941. Brædstrup Municipal School; Established c. 1890. Occupied by German troops during World War II. Brædstrup Hospital; Built 1892-93 and expanded several times. Brædstrup Old Town Hall; Built c. 1970. Today used as municipal building and library. Brædstrup Station; Active 1899-1968. Today occupied by a private company. Brædstrup Post Office; Postal service established 1875. Current building erected in 1921. Hotel Pejsegården; Built 1969-1971 and expanded multiple times. Brædstrup Gymnasium; Used primarily for team handball. Brædstrup Kro; Inn established late 18th century. Wikimedia Commons has media related to Brædstrup.